Dirty Dangle Hockey: Who Is Peter Holland? News spread quickly this morning when it was announced the Maple Leafs had shipped Jesse Blacker and two picks to the Ducks for Peter Holland and Brad Staubitz. At one point, Peter Holland was the #1 trending topic in Canada (welcome to Toronto, kid). It was no surprise that while out for brunch I heard a guy ask his friend, "who is Peter Holland?" As much as I wanted to turn around and drop some knowledge, I decided to finish my sky high french toast and listen instead. His friend told him he thought Holland was going to be a bigger and stronger version of Kadri - I definitely enjoyed listening to that conversation while my eyes almost rolled out of my head. So who is Peter Holland? 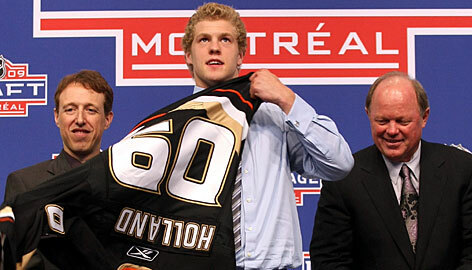 The 22-year-old, Peter Holland, was drafted 15th overall in 2009 by the Ducks and will be a favourite of Don Cherry having been born in Caledon, Ontario. Holland spent his junior days lighting it up for the Guelph Storm in the OHL putting up 258 points in 256 career junior games. I went to a fair amount of Storm games while attending university there and he was always a fan favourite with his offence and compete level every night. Holland has also been a pretty solid point producer in the AHL, putting up 114 points in 129 games with the Norfolk Admirals. Listed at 6'2" and 194 pounds, Holland brings some size down the middle and might be realizing he needs to do more then just put up points to make the show. Through 10 games in the AHL this season, Holland had 2 fighting majors which matched his total from last season in 45 games. Throw in 5 goals, 4 assists, and a +4 and he's got a nice little statline in the AHL this season. In limited action with the Ducks this season, Holland scored a goal and 3 shots on goal while averaging just over 9 minutes/game in 4 games played. So should Maple Leafs fans be jumping around celebrating another steal of a deal with the Ducks? Holland does have top-6 talent and could be a 2nd line centre if everything clicks for him, but chances are if he works on his defensive game he is more likely to be a solid 3rd liner which is not bad considering Jesse Blacker looks to be a fringe NHLer. Let's just remember the last former 1st rounder the Ducks gave up on and traded to the Maple Leafs was Jake Gardiner and that seemed to work out well for the Buds. He looked decent last night. Some flashes of talent but I would rather see Trevor Smith on the top line for now.